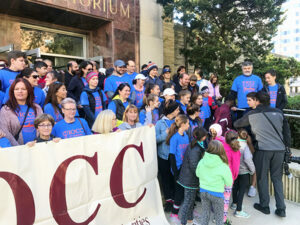 A fabulous group of Clergy, HRSOC Teens, Young Adult Group, and Parents from our Cathedral all participated in the IOCC 5K Walk this morning hosted at the St. Andrew Greek Orthodox Church in Chicago. Almost 300 participants participated in today’s walk that supports the emergency relief and assistance IOCC provides to people in need worldwide. A short video was presented to communicate to everyone present about the work of IOCC, followed by a prayer. The youth were reminded that their participation today helps needy people in crisis to receive food, shelter, clean water, and more. Our HRSOC group enjoyed the 5K Walk along Lake Michigan on this beautiful sunny morning. Mr. Milovan Grcic, 1st VP of the Church Executive Board, for sponsoring the registration fee for all HRSOC Teens. St. Andrew’s Philoptochos (Kolo Sisters) prepared a wonderful breakfast after the walk. It was truly a blessed day!